Today I am making my daughter a princess crown. I was following my older pattern when I realized I needed to make a couple small improvements. I hope you enjoy this one even more than the last. Also, check out the Kings Crown and the 0-3 month Princess Crown. Have you tried hitting Ctrl P ? And then hit print preview so you can select the exact pages you would like to print. 🙂 Let me know if that doesn’t work. 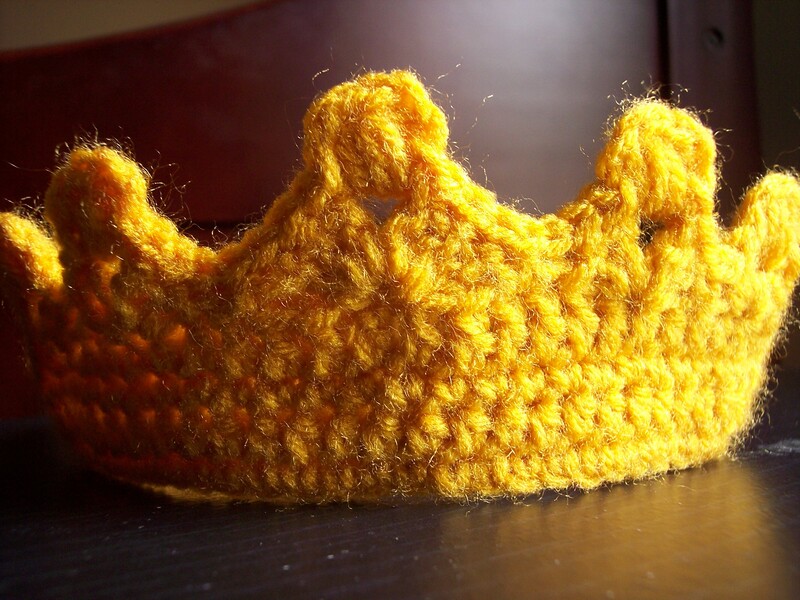 I have used your princess crown pattern before, but I need to make one for my niece, and she’s only 5 months old- her head is 41 cm- how many chains do you think I should start with? I can figure out the other adjustments on my own I think, just need a place to start. Or I could do trial and error, lol. Do you have anything to measure with? If her head is 41 cm, you will want you starting CH to be around 39 cm. Just a little smaller than what she measures so it doesn’t just fall off. Let me know if that works for you. thank you for the fun patterns ! i am going to make a tutu crown set today !! also the sock monkey so so bananalicious ! Thank you for your wonderful patterns. 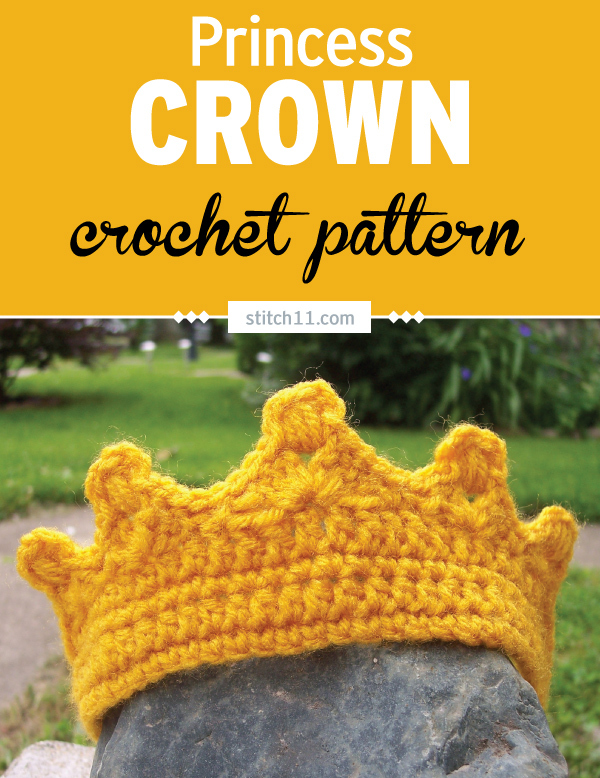 On this pattern for the princess crown, I can not get the pdf. when I click on the pdf all I get is the first paragragh and the pictures only. It does not give me the pattern so that I can print it out. The preview also comes up with only the first paragraph and the pictures only. Again Thank you. Maybe you could try to hit CTRL P and then select “print preview” to choose what pages to print. Let me know if you still have any issues. Thank you very much for sharing your pattern. I just finished my first crown and it is sooooo cute. My niece will be the cutest princess! I love the pattern but do you have any counts for babies? 0-3, 3-6 6-9? That is the age group I really want! Here is my 0-3 month size https://stitch11.com/size-0-3-month-princess-crown/ If you would like to make them custom for each size, just make your starting CH the desired length. And follow the pattern the rest of the way 😀 Would love to see photos when you are finished! Just asking what skip stitch means and why is it double underlined. It means you skip the next stitch… and my guess with the double underline would be my infolinks. Thank you for sharing. So cute. How do I fit this to an adult size? I would make the child size version but maybe add 4 stitches to the starting chain. To be honest, if I make them again I would use the FSC instead of a regular chain. I did some experimenting with this pattern awhile ago, and I figured out that you might need either a size H or I, along with the instructions you gave me, to make this for an adult. Did you use the clean print icon at end of the post? Have you used the print friendly button towards the bottom of the post? You should be able to choose what you print and what you don’t print. If that doesn’t work, you should be able to do it from the print friendly website or even using your “snip it” tool from your computer. Thanks so much for the pattern. I just made one for my 6 month old granddaughter who is going to be Princess Peach for Halloween. I used I Love This Cotton and it is beautiful and fits great. Thanks again. I am making this for my 3.5 yr old. I just finished the the first row of sc. It is barley fitting my 3 month old☺️ I tend to crochet tight. I am wondering if there is a method for making it to fit? If I just measure the chain around her head as I go will that make a gods for or end up being too big? Thank you very much finishing off her princess costume! Thanks so much for this lovely pattern. It’s quick and easy, very clearly stated and absolutely adorable.